Welcome to Annie's Cottage Crafts. The new home of Annie's Cottage Crafts will be located in the rainforest within the environs of the Blue Tier Reserve, inland from St Helens on the East coast of Tasmania. Famous as the gateway to the iconic 'Bay of Fires' St Helens is a popular tourist destination featuring a mild climate, beautiful coastal and rainforest scenery. Our new location, which will feature Bed & Breakfast accommodation, cafe and quilting shop shall open later in 2014. We currently specialize in designs by McKenna Ryan of Pine Needles Designs and Judy Niemeyer of Judy Niemeyer Quilting (Quiltworx). In addition we also carry a comprehensive range of patterns, patchwork fabrics and notions. Recent additions to McKenna's designs of 'From the Coast With Love', 'Dog Park', 'Wind in the Whiskers' and 'Heaven & Nature Sing' are among many of the designs offered as either as patterns, kits or block of the month. Individual block kits are also available upon request. Easy to follow patterns make these designs suitable for both machine and hand stitching, plus McKenna's smaller ranges of individual themes including 'Snow Buds', 'Naturally McKenna', 'Which Came First? ', 'Coffee Classics', 'Cucina Italiana' and 'Gingerbread Lane' can be great projects to ease into more intricate designs. 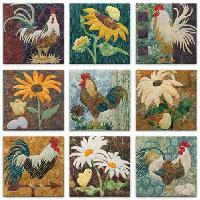 Annie's Cottage Crafts is a certified Quiltworx shop. This certification enables us to teach and sell patterns which are exclusive to certified shops. The designs offered this way are 'Mariners Compass' and 'Glacier Star'. We will also be featuring a series of workshops showcasing Judy's techniques.